Learning of the work of William Caslon, whose Doric & Brunel typefaces, newly digitised by Paul Barnes, are being used by David Pearson in The Gentle Author’s London Album, I was inspired to write this brief account of the life of Britain’s most celebrated letter founder. 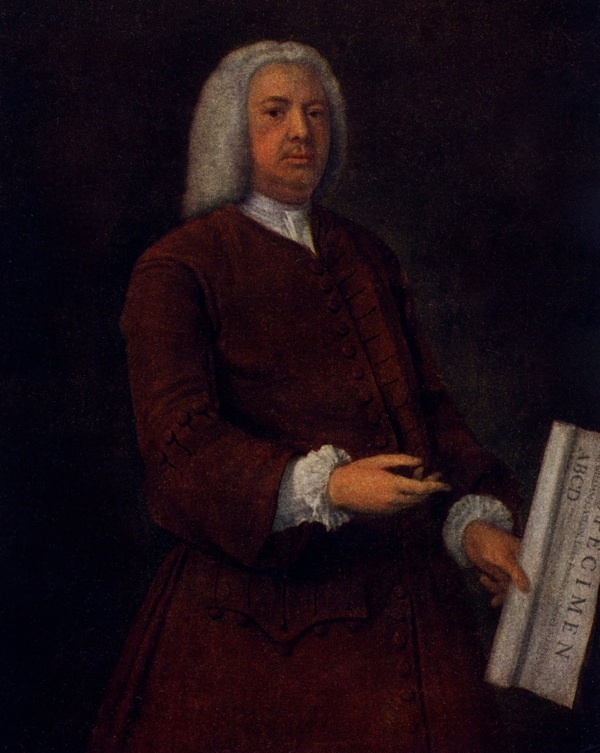 William Caslon was the first major letter founder in London and, nearly three centuries later, remains the pre-eminent letter founder this country has produced. 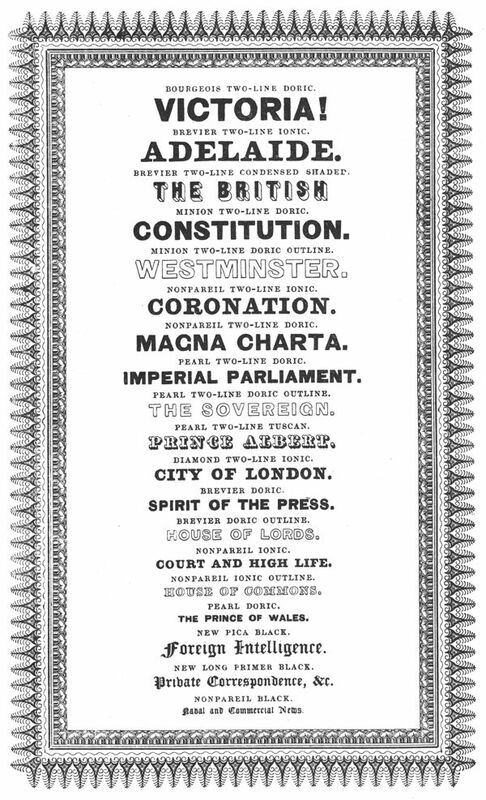 Before Caslon, there was little letter founding in Britain and most type was imported – even Shakespeare’s First Folio was printed with French type. But Caslon’s achievement was to realise designs and produce type which have been widely used ever since. And it all happened here, around the eastern fringes of the City of London. 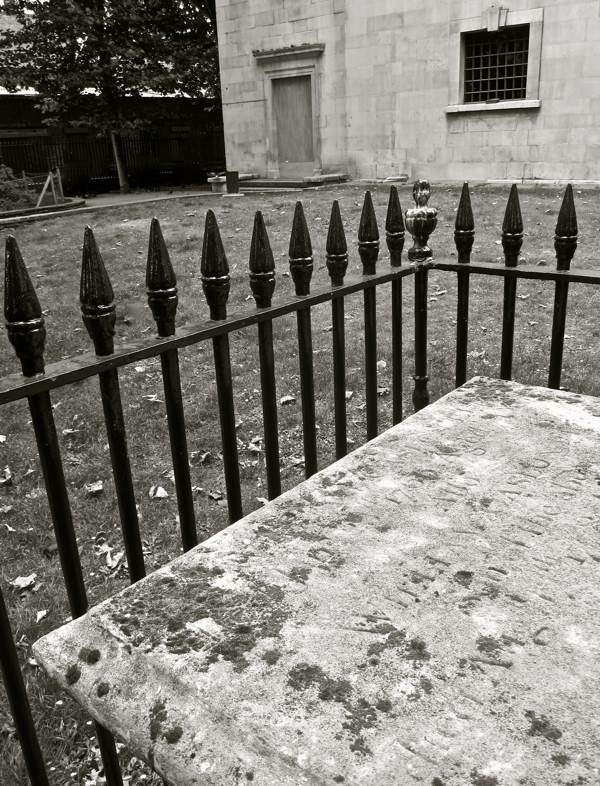 The Caslon family tomb stands alone today in front of St Luke’s Old St, just yards from where William Caslon started his first letter foundry in Helmet Row in 1727 and, with pleasing consistency, it is lettered in Caslon type. 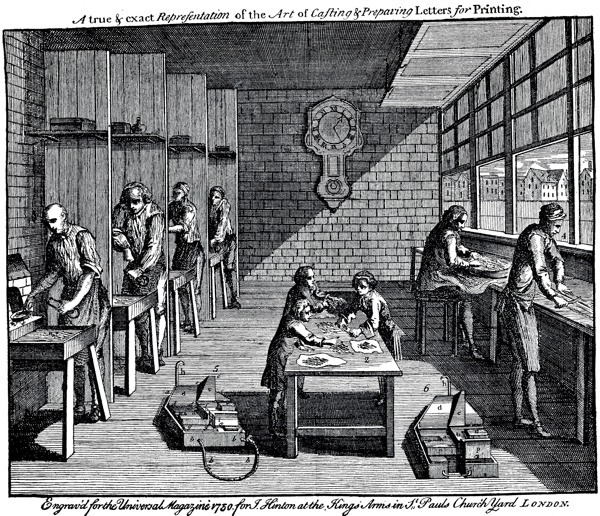 A native of Cradley in Worcestershire and the son of a shoemaker, Caslon was apprenticed as a Loriner (or metalworker) to Edward Cookes in the Minories in 1706. Here the young apprentice learnt the essentials of metal casting that were to prove so crucial to his career but, most significantly, he undertook the engraving of letters onto gun barrels. Equally, the company produced punches of letters for book-binding and there is a legend that Caslon’s talent for type design was first spotted by a printer, coming upon his lettering upon the spine of a book in a shop. 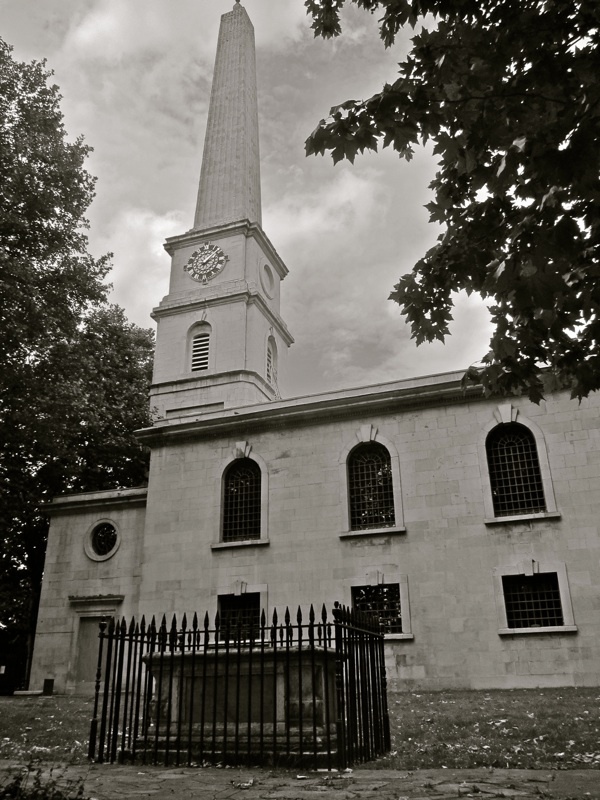 Marrying the sister of a fellow apprentice in 1719, Caslon set up his first type foundry in Helmet Row in 1727. This initiative was based upon the success of a commission for the Society for the Promotion of Christian Knowledge who required an Arabic typeface to be used in religious texts distributed among Christian communities in the Middle East. 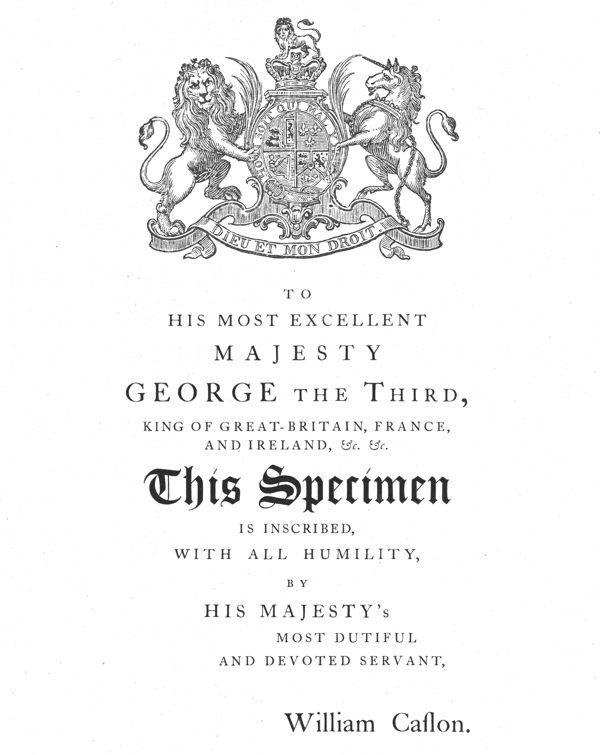 Yet it was in the creation of his distinctly English version of Roman letters and italics, derived from the Dutch typefaces that were most commonly used in London at that time, which was the decisive factor in the establishment of Caslon’s reputation. 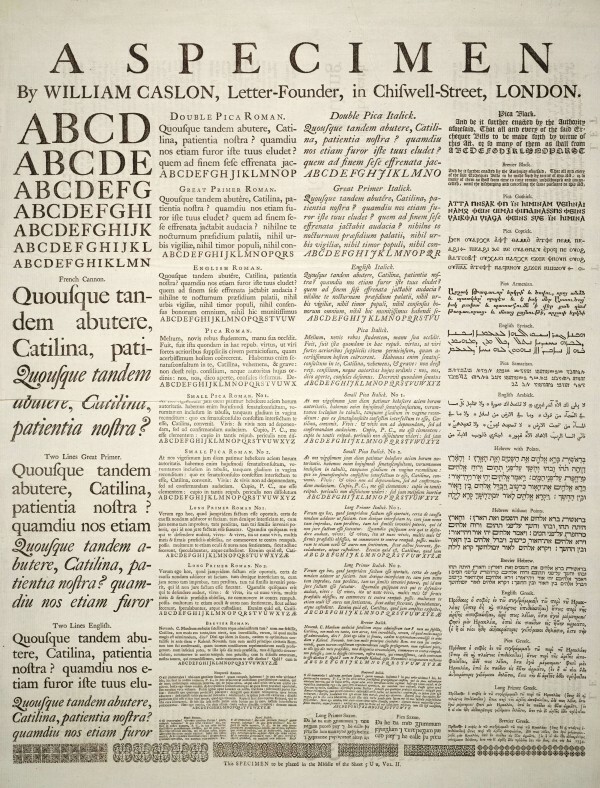 Caslon’s first type Specimen of 1734 exemplifies a confidence and clarity of design which has become so familiar that it is difficult to appreciate in retrospect. The Specimen offered a range of styles and sizes of type with an unprecedented authority and a distinctive personality which is immediately recognisable. As a consequence of the legibility and grace of Caslon’s work, his became the default choice of typeface for books and all kinds of publications in the English-speaking world for the next two centuries. Caslon’s own background in engraving and metalwork was the ideal preparation for the cutting of letter punches and, among the related trades of watch-making and instrument-making which thrived in the City of London, he was able to find others with the necessary skills. Each letter had to be cut by hand at first and some of these punches are preserved at St Bride Printing Library – breathtakingly intricate pieces of metalwork upon a microscopic scale. Once complete, these punches were impressed into copper to make moulds, known as matrices, that were used for the casting of type for printing. 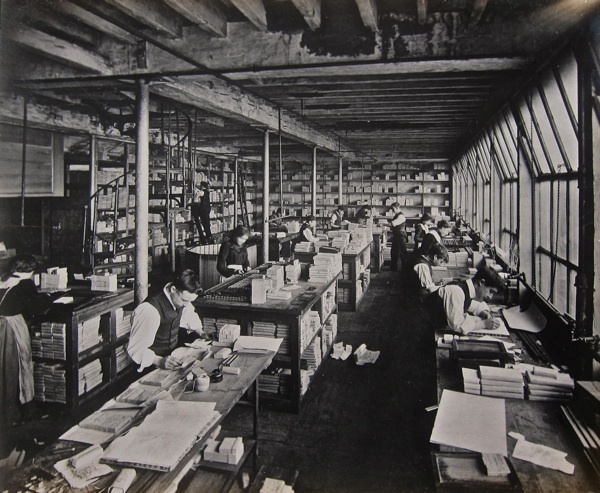 Moving in 1727 to larger premises in Ironmongers’ Row, by 1730 Caslon had eclipsed his competitors, securing the exclusive contract to supply type to the King’s printers. Later, Benjamin Franklin was to choose Caslon’s type for printing both the Declaration of Independence and the American Constitution. 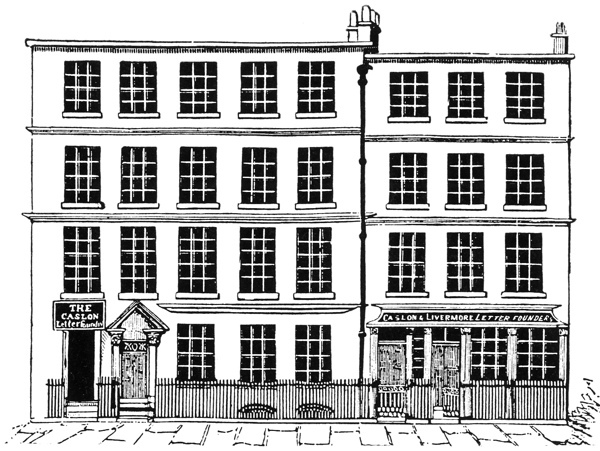 In 1734, Caslon established himself in his permanent premises in Chiswell St, where the letter foundry continued until 1936. 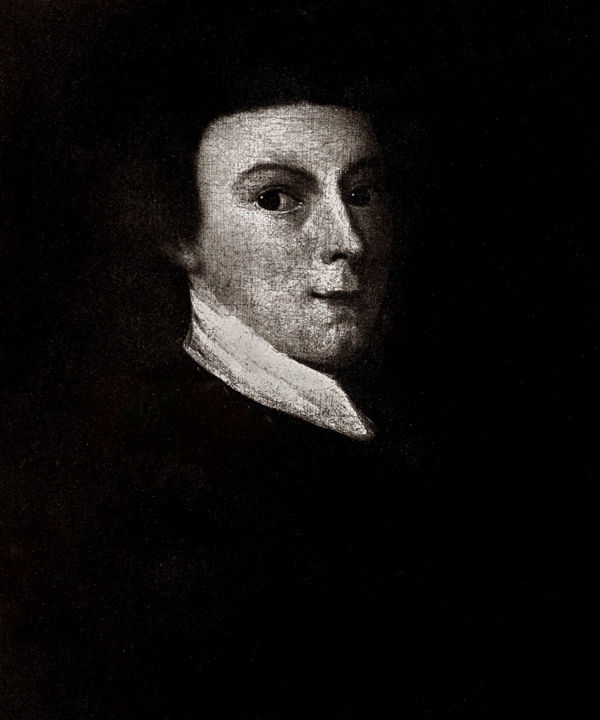 At this address, he staged monthly concerts upon an organ fitted into his music room, serving beer that he brewed himself. 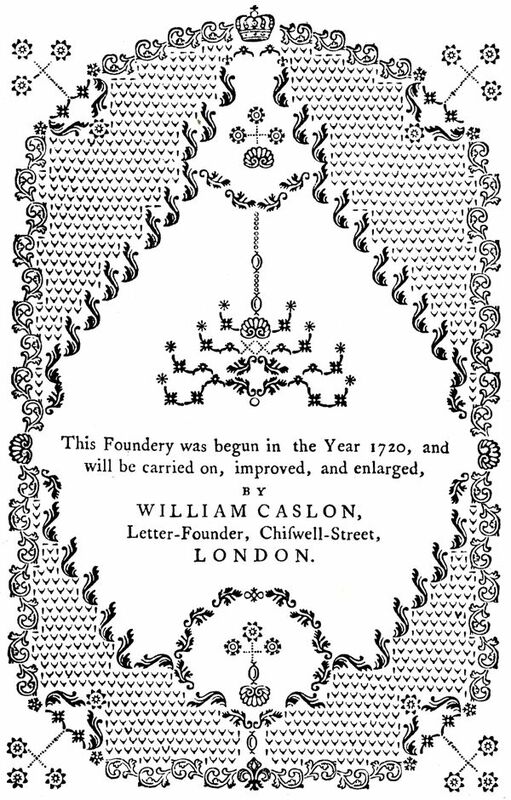 Caslon had inaugurated a long-standing dynasty, naming his first son William and, by 1742, specimens designed by William Caslon junior were being produced. It was a pattern that, like the typefaces, was replicated until well into the twentieth century. 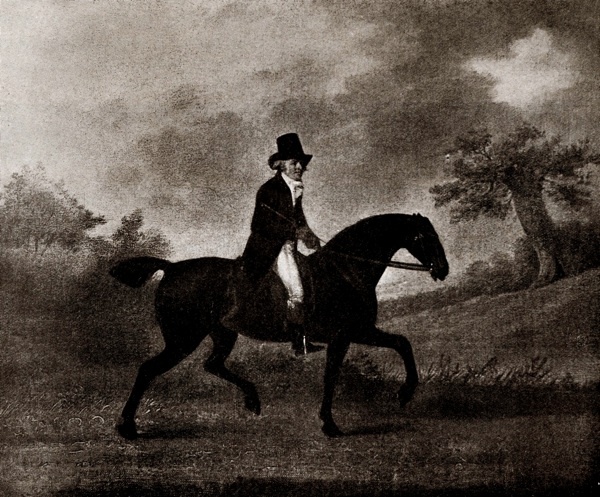 Caslon retired in 1750 to a house in the Hackney Rd opposite the Nag’s Head (where Hackney City Farm is today), and soon after he moved into his country house in Bethnal Green, where he died in 1766. Within a generation, Caslon’s first types acquired the moniker Caslon Old Face, referring to their antique credentials yet, with innumerable recuttings, these typefaces have persisted to the present day when other types that once superceded them have been long forgotten. Caslon’s letters are often characterised as distinctively British in their sensibility and there is a lack of uniformity among them which sets them apart from their European counterparts, yet the merit of Caslon’s letters is their ability to mingle harmoniously among their fellows and create a pleasing texture upon the page – balancing the requirements of order and variety to achieve a satisfying unity. In Helmet Row, off Old St, where William Caslon established his first type foundry in 1727. 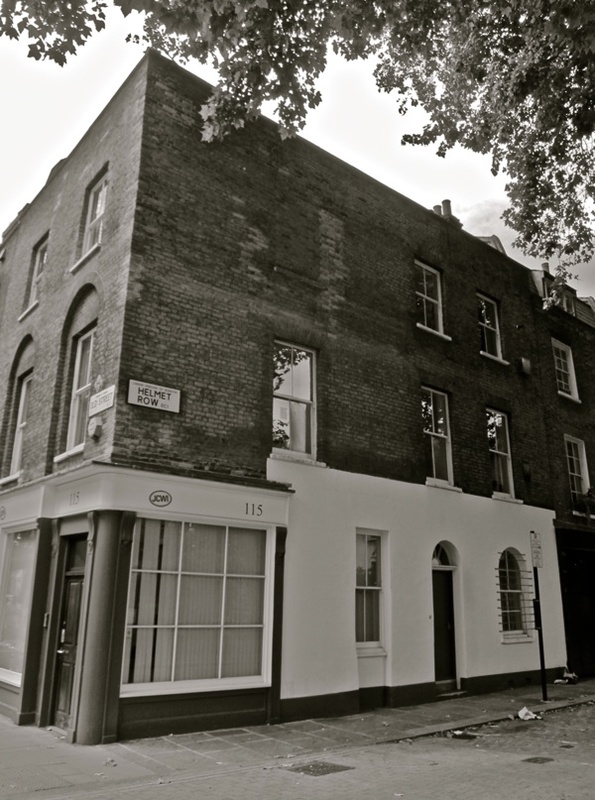 The Caslon Letter Foundry in Chiswell St ran from 1734 until 1936. 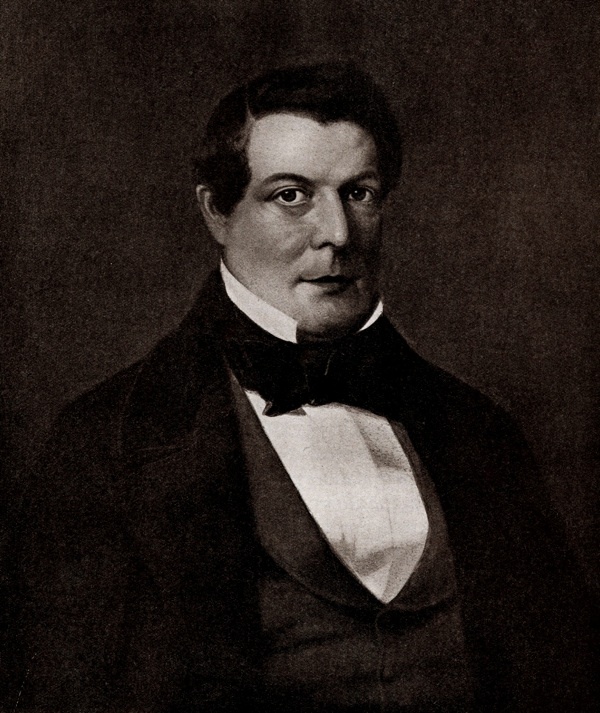 Display faces became very popular in the nineteenth century. 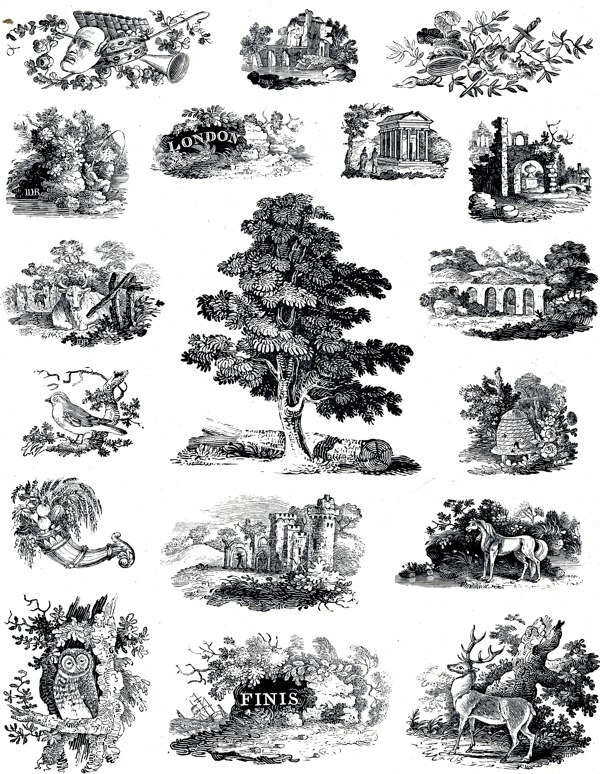 Vignettes from a nineteenth century Caslon Specimen Book. 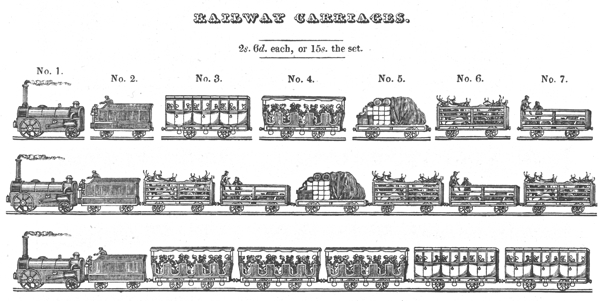 Steam trains from a Caslon Specimen Book. The Caslon Family tomb at St Luke’s Old St.
Caslon letters on Caslon’s tomb. There was demand for Anglo Saxon typeface in 1734! wow. Love the Henry William Caslon IV portrait, it looks very modern. 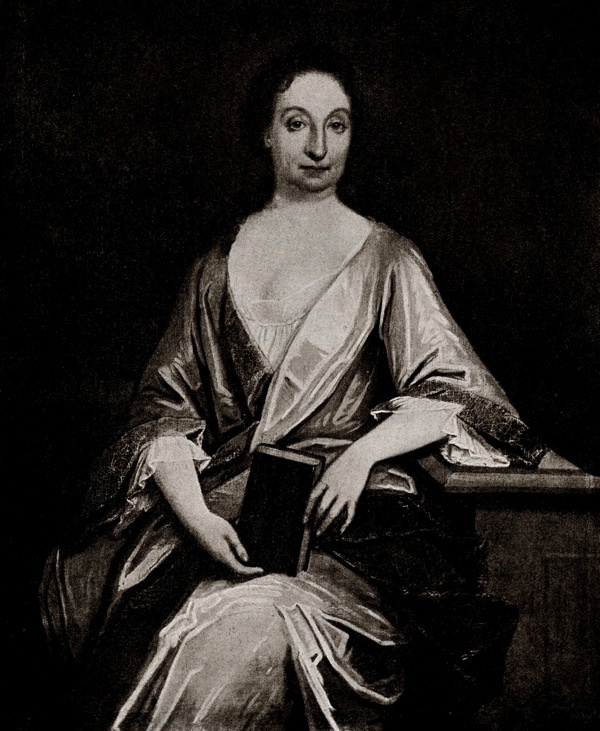 The mother of Henry William Caslon V must have had a very striking nose, to change the already striking nose so much. 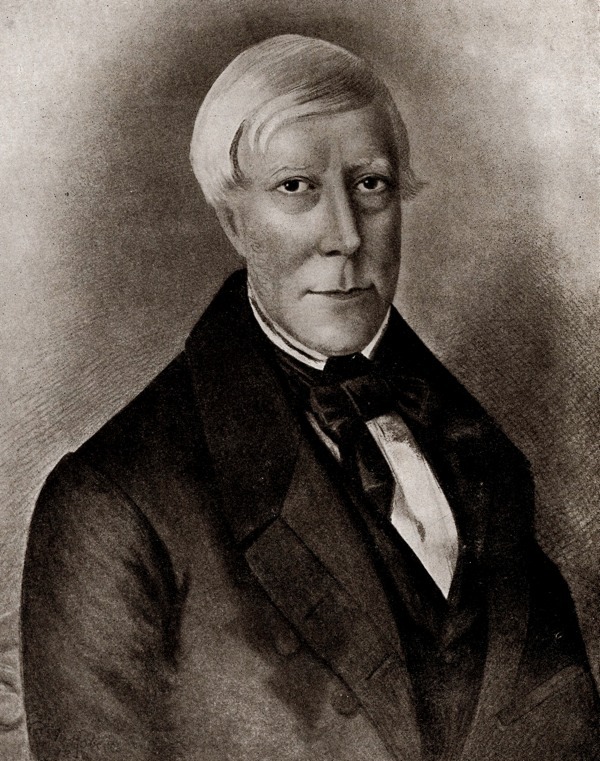 Organ music, beer and type – what a fabulous life and legacy!